What a change to review a performance that is not a one-off. The dance group KAGE, which was established in 1997 by Victorian College of the Arts dance graduates Kate Denborough and Gerard Van Dyck, will present this dance theatre many times during the jazz festival (see MIJF program for details), so there will be more opportunities to hear, or feel, what’s presented. I would strongly suggest that you take those opportunities, because this is a thrilling, compelling and challenging work. Having experienced it once, I immediately felt I’d like to do so again. 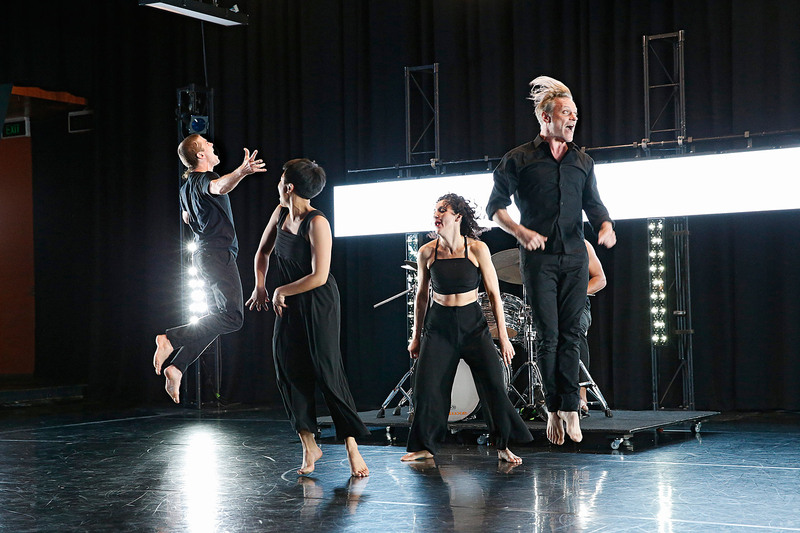 One of the artists in Out Of Earshot, Melbourne dancer Anna Seymour, was born profoundly deaf. At one point in the performance she lies across the lap of drummer Myele Manzanza — who jazz fans may know through his work with Ross McHenry or Marcus Strickland — with her ear to the skin of a drum. It is a powerful image. This work is not meant especially for people who are deaf or whose hearing is impaired. Rather it aims to shift an audience’s perception of sound. Many in the audience on opening night were signing beforehand, and at the end delivered their applause by drumming feet and raising hands while rapidly twisting wrists. That suggested they were appreciative, but I can’t say what it was like to experience this without hearing or with limited hearing. The mechanics of Out of Earshot are simple to explain, undeniably not easy to execute. 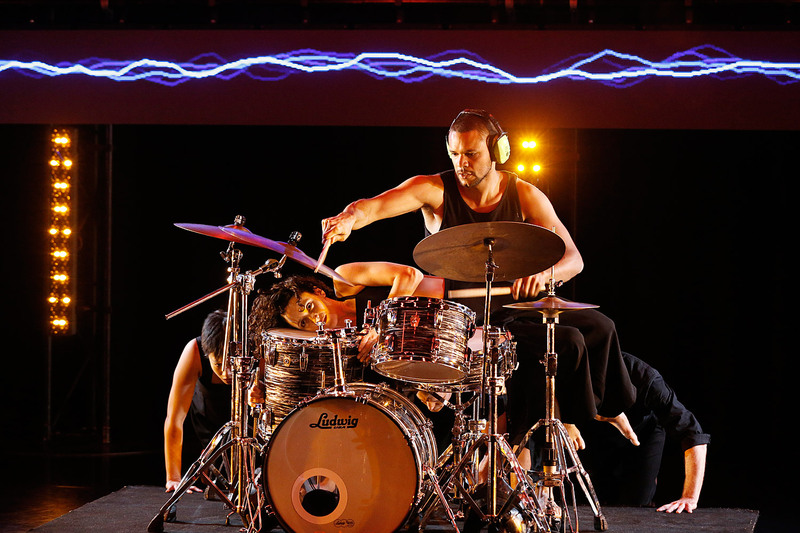 Four dancers react to Manzanza’s rhythms, which he creates using bodies, the floor and a drum kit that the dancers move and rotate. Panels of light on three walls change colour and reflect the beat visually. 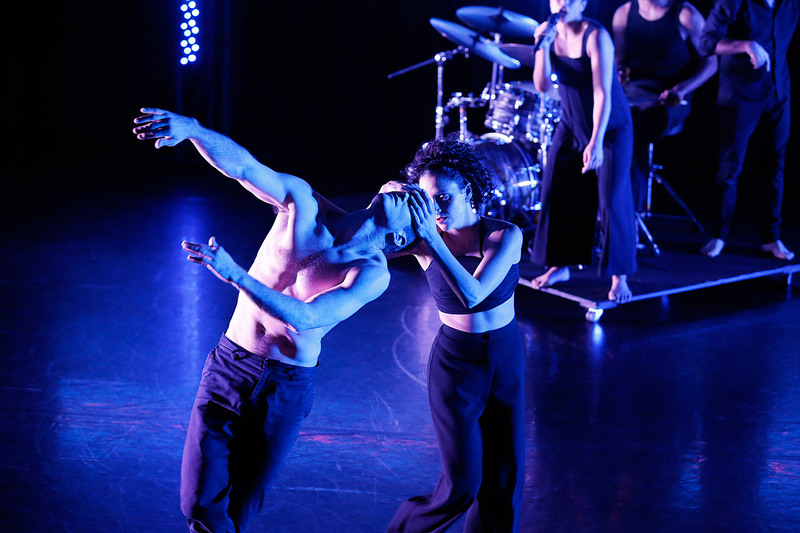 The dancers also tell stories in their interactions with each other and the drummer. It is physically demanding and calls for taut responses as well as slow rolls and grapplings. Body contact is integral. All five performers are superb. Program notes explain that Out of Earshot focuses on passion, empathy, exhilaration and intimacy; that it treats silence not as a lack of sound but a state that can convey emotion and feeling; and that it offers us glimpses of many global experiences, learned and from research. So does it deliver? There is no doubt about that, although I may not have noticed or understood all that was being communicated. This performance begins and ends with body percussion that conveys and reflects the heartbeats within us. In between I felt the dancers explored many things: the acceptance of closeness; trust, mutual or one-way; struggle and support; connectedness and distance; silence and separation (via protective earmuffs); the attraction and power of rhythm; a beat as initiating action; agitation (perhaps with being separated from sound); touch as a life-giving force; sound as a controlling mechanism; sound as absence (exemplified in silent drumming, silent singing); initiation and submission in relationships; and delightful humour (when Elle Evangelista channels Nicki Minaj’s rap song Super Bass with its entirely apt line “you’ve got my heartbeat running away”). I was blown away by Manzanza’s work with his drumsticks while seated on the floor. I was puzzled by dancers’ grappling with and clinging to the drummer, possibly to distract him, curb his volume or cool his fire. I was intrigued by how much body contact could occur without necessarily conveying intimacy and how little eye contact there seemed to be in many of these interactions — perhaps reflecting our society’s separateness. And I was moved and mystified by powerful coupling almost at the end, when Anna Seymour’s hand over Timothy Ohl‘s eyes was a constant amid their closeness. It is hard not to feel the connectedness of humanity when all performers gather at the end, linked by the simple heartbeats created from their bodies. There was much skill on show in Out of Earshot and many provocative and stimulating thoughts arising from the interactions and movements that an audience could take away to ponder. It is worth seeing and hearing this work — not only via the ears. Its reverberations will be felt long after you leave. KAGE creates performances that “relate and respond to current social thinking”. This entry was posted in ARTICLES, JAZZ FESTIVALS, MIJF 2017 and tagged 2017, Ausjazz, Chunky Move, KAGE, melbourne international jazz festival, MIJF, Out of Earshot, Review, Roger Mitchell. Bookmark the permalink.